What makes Vietnam’s e-commerce scene attractive to investors, and which companies have put their money into this market? In the eyes of many investors, Vietnam is one of the most attractive e-commerce markets in the region. With a stunning 33% Compound Annual Growth Rate (CAGR) over the past couple of years, Vietnam ranks among the highest eCommerce growth in the region. Frost & Sullivan also forecasted that the e-commerce market in Vietnam will reach $ 3.7 billion by 2030. The year 2017 alone is a flourishing year for Vietnam’s e-commerce market with the huge amount of investment coming foreign investors. The list of investors who invested the most in Vietnam’s e-commerce market includes Alibaba, Tencent, Temasek Holdings, Dragon Capital and CyberAgent Ventures and IDG Ventures Vietnam. Alibaba, Tencent, and Temasek started to invest in Vietnam’s e-commerce market in recent years, while both Dragon Capital and IDG Ventures Vietnam had been in the market since the early start. In January 2018, JD.com, owned by Tencent, the largest Internet company in China, completed its large-scale investment in Tiki.vn and became the largest shareholder of Tiki. The exact amount of investment was not disclosed by both parties, but local media estimated it to be $ 44 million. Tencent also recently expanded its stake in Vietnam’s largest digital content company and the only Unicorn in Vietnam- VNG. The figure is confidential, but according to a credible news source, VNG ‘s largest foreign shareholder is now Tencent. In addition, Singapore-based SEA Limited (Garena) has entered Vietnam market through Shopee, the mobile-first marketplace platform. The largest shareholder of SEA Limited, which operates Shopee, is Tencent. Lazada is backed by the two giants: Alibaba- Chinese multinational e-commerce and technology conglomerate and Temasek Holdings- Global Investment company owned by The Government of Singapore. In November 2014, Lazada announced the funding worth a $ 249 million from Temasek Holdings. In June 2017, China’s Alibaba invested $ 1 billion in Lazada, increased its total stake to 83%. Prior to the Lazada investment, Temasek also invested in FPT Corporation, an Internet corporation which owns Sendo and FPT Shop. As of July 2018, Sendo has become one of the most popular e-commerce platforms in Vietnam in term of web traffic, according to Similar Web. The research also revealed that Vietnam is a potential market for investors from different parts of the World. Japan, Germany, the USA, Korea, China, and Singapore are where major investors came from. 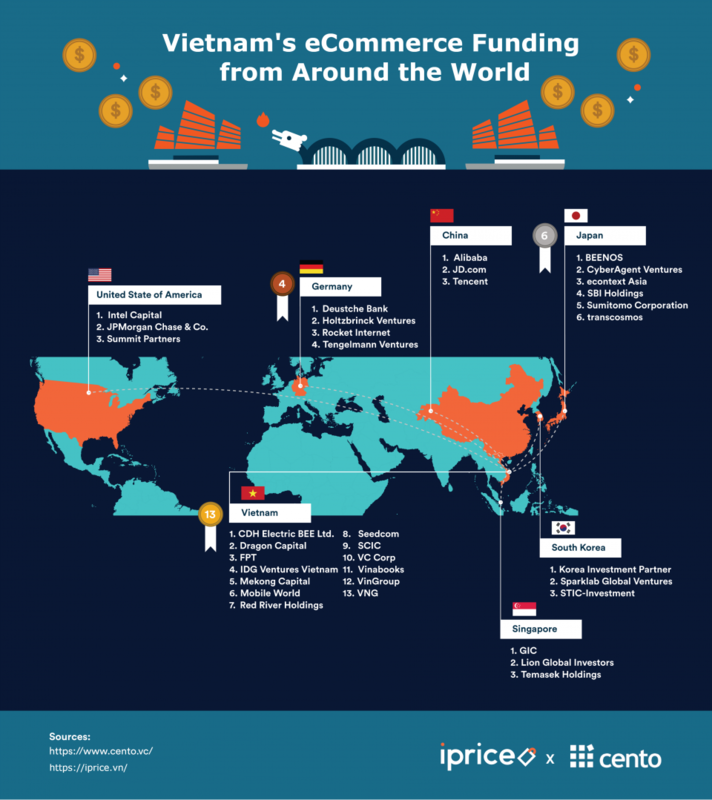 With six investors invested in Vietnam’s e-commerce (BEENOS, CyberAgent Ventures, econtext Asia, SBI Holdings, Sumitomo Corporation, Trancosmos), Japan had become the country where most investors come from. In 2017, Japan invested a total of $ 9.1 billion in Vietnam, taking over Korea ($ 8.5 billion) and ranked as the largest foreign direct investment (FDI) country in Vietnam. Germany and the United States are two countries outside of Asia that actively invested in Vietnam e-commerce market. In 2012, Intel Capital, the investment arm of the computer processor giant, revealed that it has invested a combined $17 million in two Internet companies in Southeast Asia, including VC Corp- the Internet content firm. VC Corp had since then known as the parent company of several e-commerce platforms: Mua Re, Enbac, Mua Chung, Rong Bay. Nevertheless, the list of US investors continued with JPMorgan Chase & Co. and Summit Partners. Deutsche Bank and Rocket Internet are among the most famous German investors in Vietnam. After selling several start-ups like Easy Taxi, Foodpanda, Zalora to its competitors, Rocket Internet’s strongest presence in Vietnam remained with its investment in Lazada. Deutsche Bank had become one of the largest shareholders of FPT Corporation since 2007. The German investment bank and financial services company increase its share in FPT in June 2011. 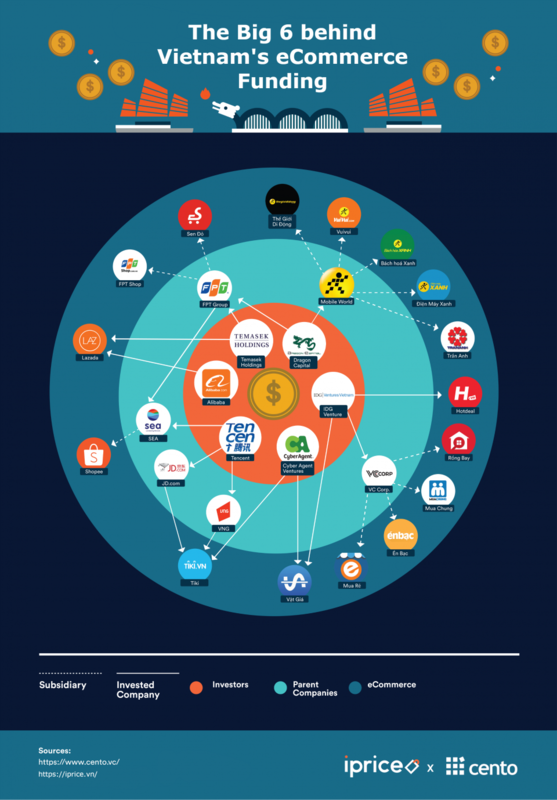 The post These infographics show how Vietnam’s e-commerce industry got invested appeared first on e27.